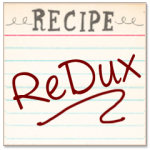 It is that time again, another Recipe Redux! This month’s theme is using fresh pumpkin. 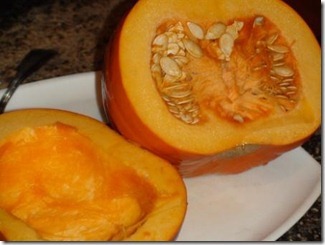 And this was certainly a challenge for me as I have never used fresh pumpkin. I’ve always gone for the canned. I don’t know why really, but I guess because of convenience. However, using fresh pumpkin really isn’t all that inconvenient either. And the results are a much brighter flavor than canned! Guess I have no more excuses! 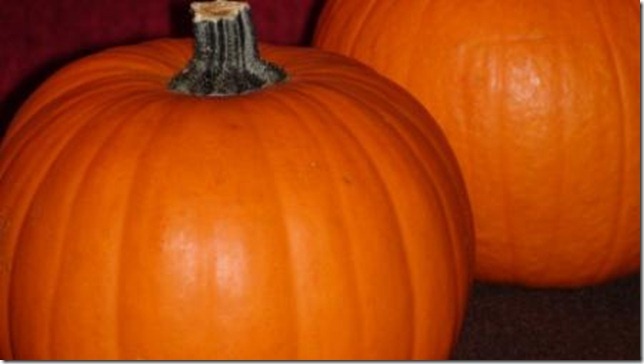 Just be sure to use a “pie” or “sugar” pumpkin which are generally much smaller than those you buy for carving. I found some at my local farmer’s market as well as at my local Super Target. Pumpkin is such a versatile ingredient, as you will no doubt see from reading all of the blog posts linked at the bottom of this one. 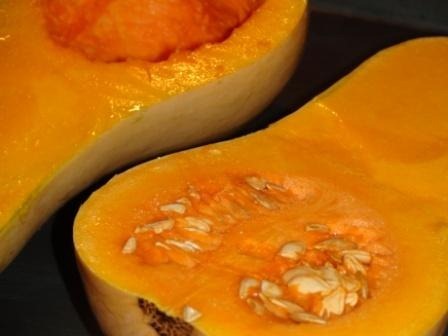 Pumpkin is a great substitute in baked goods for some of the fat. 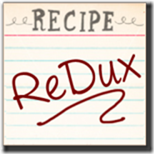 It is also a great addition to sauces and soups to boost the nutrition factor. 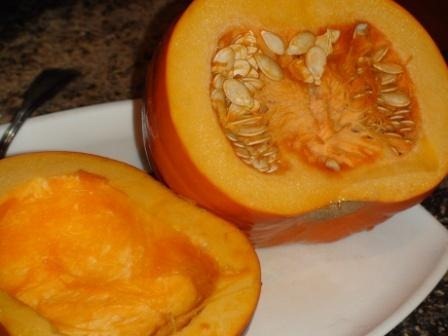 Pumpkin is loaded with vitamin A, vitamin C, vitamin E, fiber and iron. For some of my other favorite pumpkin creations, check out my Pumpkin French Toast and Pumpkin Cranberry Muffins. I decided to do something a little different for this month’s challenge though, which was inspired by a soup I had on my recent Alaskan cruise as well as our apple picking excursion from this past weekend. 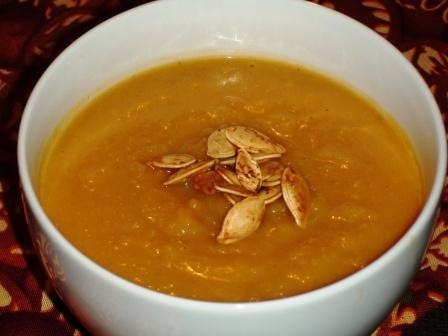 It is a Roasted Pumpkin, Squash and Apple soup. I ended up using butternut squash, though acorn squash would have been a good substitute as well. 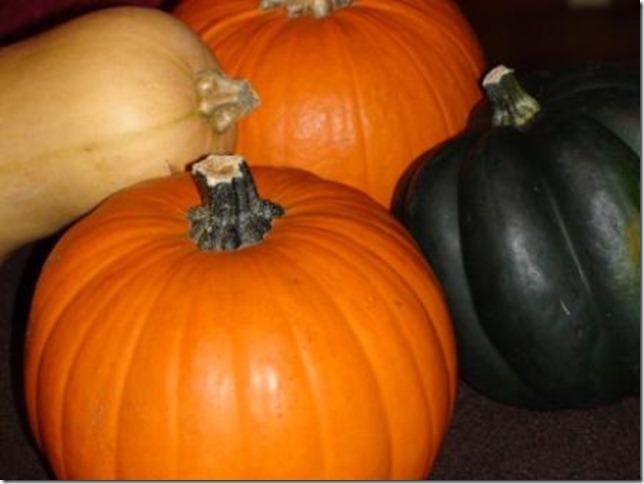 First, cut the pumpkin and squash in half with a SHARP knife (be careful but you gotta put a little muscle into it). Scoop out the seeds and the all the stringy stuff. Don’t forget to save the pumpkin seeds though and roast those for a snack or garnish! Next, put the pumpkin and squash cut side down on an aluminum foil lined baking sheet. Cover the pumpkin with aluminum foil as well. Put in a 350 degree oven and allow to roast until skin is tender and can press through easily with a knife. This took about an hour in my oven. 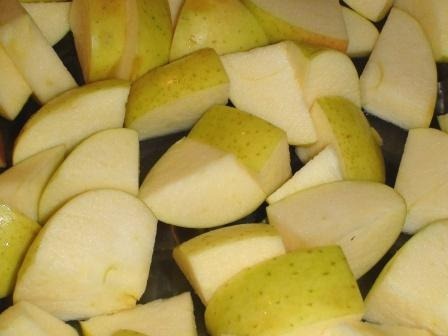 Meanwhile, core and roughly chop up 3 large apples (I used Golden Delicious) and spread in one layer on a pan. Also, roughly chop a medium sized onion, spread evenly in one layer on a pan and sprinkle with olive oil. 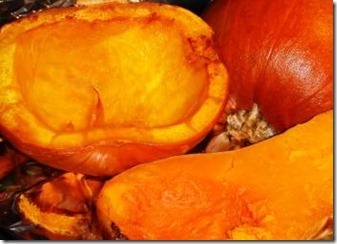 When pumpkin and squash are finished roasting, remove from the oven and allow to cool until you can remove the flesh. Roast the apples and onions while the squash and pumpkin are cooling. Once the squash and pumpkin are cool enough to handle, gently remove the flesh from the skins and place the flesh in a stockpot. 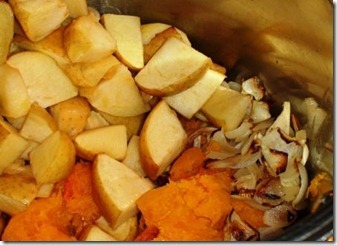 Add the apples and onions once they are finished roasting as well. Then pour in the liquids and puree with an immersion blender. Stir in the spices. Add more liquids as needed to reach the desired consistency. Enjoy! 2. Place cut sides of pumpkin and squash down on an aluminum foil lined baking sheet. 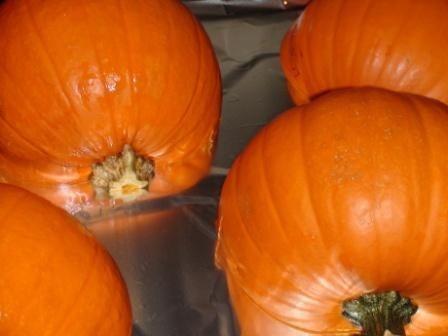 Cover the pumpkin with aluminum foil. Put in the oven and roast until fork tender, about one hour. 3. Remove pumpkin and squash from the oven and allow to cool. 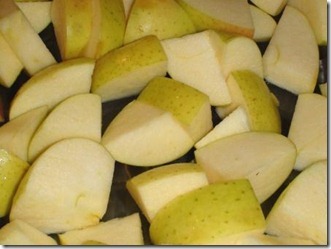 Arrange in a single layer the apples and onions on baking sheets. Drizzle the onion with olive oil. 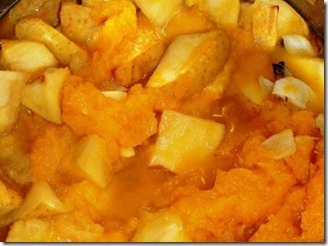 Put apples and onion in the oven to roast while the pumpkin and squash cool. 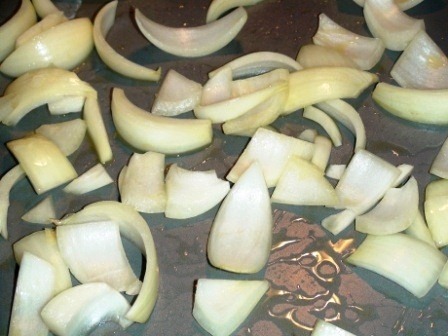 Roast apples and onions until lightly browned, about 20 minutes. 4. Once pumpkin and squash are cool enough to handle, remove the flesh from the skins and place the flesh in a stockpot. 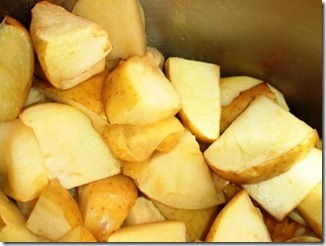 Add the apples and onions once they are roasted. Pour in the chicken broth and milk. 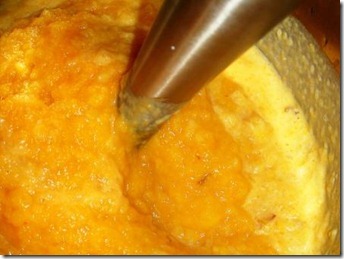 Using an immersion blender, puree the mixture. 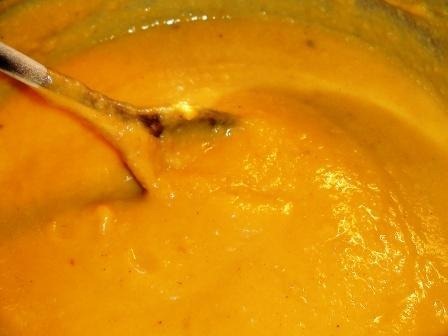 If you do not have an immersion blender, this can be done in batches with a blender or food processor. 5. Stir in the spices and bring the soup to a simmer. Simmer for 20 minutes. Add more liquid if needed to reach the desired consistency. 6. Garnish with roasted pumpkin seeds or toasted walnuts. A dollop of reduced fat sour cream or plain Greek yogurt is optional as well. Enjoy!